October 2011 Louisville Home Sales Up! Ford employees transferring to Louisville may be playing a small part in keeping Louisville homes sales moving upward! The number of Louisville Homes going under contract in September 2011 was up 4.8% over September 2010. Additionally the number of homes that sold and closed during the same period was up 15%. On the surface those numbers are encouraging, but remember last year at this time we were still suffering from the tax credit whiplash. Many people who were going to buy during the 2nd and 3rd quarter of 2010 jumped in the housing market early to take advantage of the tax credits. The point is it’s not terribly difficult to beat last year’s home sale numbers. Still the influx of Ford employees could help keep Louisville area home sales moving in a positive direction. Many of those employees are looking for homes in the $150,000-$250,000 price range with some acreage. But almost all want deals because they are coming from towns where they’re selling their homes for less than appraised values expecting to make up their loss on this end. The homes they will buy will be perceived as the best values in the area. The same can be said about all buyers moving to Louisville from other towns. If you’re a seller you need to have your home looking near perfect, staged properly, de-cluttered, priced at the lower 1/3 of the comparable homes in your area. Any deviation from that formula and you’ll sit on the market. A point of interest for you, that formula works! Most of our our sellers who followed that formula have sold. In July we put 19 homes under contract, in August 21 homes under contract and in September 14 homes under contract. We’re ahead of our goals and on target to set a new record. If your thinking of selling or buying we’d love to help! 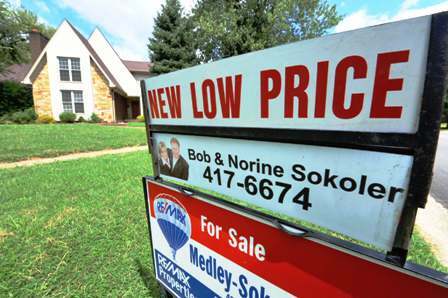 Bob Sokoler is a former Anchor/Reporter turned Louisville Realtor 7 years ago, and co-owner of The Medley Sokoler Team in Louisville Kentucky. You can learn more about Bob, his Team by clicking Louisville Real Estate.